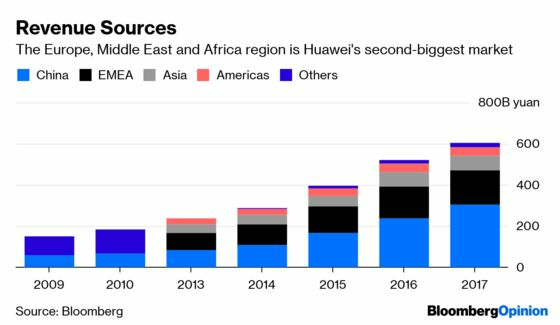 (Bloomberg Opinion) -- Huawei Technologies Co.’s telecommunications equipment isn’t just vulnerable to Chinese state hacking. It’s susceptible to attacks from plenty of others besides. That was a key finding in the annual report from Britain’s Huawei Cyber Security Evaluation Centre Oversight Board, the body that ensures gear from the Chinese firm in the nation’s telecommunications network is up to scratch. These findings are about basic engineering competence and cyber security hygiene that give rise to vulnerabilities that are capable of being exploited by a range of actors. NCSC [National Cyber Security Centre] does not believe that the defects identified are a result of Chinese state interference. It’s worse news for the beleaguered firm than might have been expected. So far the anxiety has focused on threats from Chinese state actors. But this is a broad criticism of the underlying quality of Huawei’s equipment. Good news, then, for rivals Nokia Oyj, Ericsson AB, and Cisco Systems Inc.
How should Huawei respond? It might try taking a leaf from Facebook Inc.’s playbook. Last year, following a series of scandals involving election manipulation, the social networking giant pledged to add thousands of employees to vet content more effectively. Huawei has been too slow to address cybersecurity shortcomings that were first raised seven years ago, and which are ongoing, according to the report. It acknowledged that the company has already promised to spend $2 billion on improving its processes over five years, but faulted a lack of clarity on those plans. While Britain has as yet refrained from an outright ban on the firm’s equipment, the company’s customers might very nearly end up doing this for them. The HCSEC, based in Oxfordshire, England, vets all Huawei equipment before it's allowed to be used in U.K. networks. Thursday’s report, which assesses the effectiveness of those checks, has identified problems with some devices and software. If Huawei fails to address the issues raised, its overall sales may suffer not just in Britain, but globally. At the very least, it needs to make moves on a similar scale to those of Facebook to assuage concerns.